This protocol describes the production of a therapeutic antibody in a mammalian expression system. The methods described include preparation of vector DNA, stable transfection and serum-free adaptation of a human embryonic kidney 293 cell line, set up of large scale cultures and purification using affinity chromatography. Elgundi, Z., Sifniotis, V., Reslan, M., Cruz, E., Kayser, V. Laboratory Scale Production and Purification of a Therapeutic Antibody. J. Vis. Exp. (119), e55153, doi:10.3791/55153 (2017). Ensuring the successful production of a therapeutic antibody begins early on in the development process. The first stage is vector expression of the antibody genes followed by stable transfection into a suitable cell line. The stable clones are subjected to screening in order to select those clones with desired production and growth characteristics. This is a critical albeit time-consuming step in the process. This protocol considers vector selection and sourcing of antibody sequences for the expression of a therapeutic antibody. The methods describe preparation of vector DNA for stable transfection of a suspension variant of human embryonic kidney 293 (HEK-293) cell line, using polyethylenimine (PEI). The cells are transfected as adherent cells in serum-containing media to maximize transfection efficiency, and afterwards adapted to serum-free conditions. Large scale production, setup as batch overgrow cultures is used to yield antibody protein that is purified by affinity chromatography using an automated fast protein liquid chromatography (FPLC) instrument. The antibody yields produced by this method can provide sufficient protein to begin initial characterization of the antibody. This may include in vitro assay development or physicochemical characterization to aid in the time-consuming task of clonal screening for lead candidates. This method can be transferable to the development of an expression system for the production of biosimilar antibodies. The success of therapeutic antibodies continues to drive substantial investment into antibody development as a wave of next generation therapeutics begins. The antibody market is expected to be reshaped by antibody fragments 1, antibody-drug conjugates 2, bispecific antibodies 3 and engineered antibodies with favorable properties 4. Another class gaining pharmaceutical interest are biosimilars. Biosimilar antibodies are 'highly similar' replicate products of a therapeutic antibody that has already received regulatory approval. A proposed biosimilar must be comparable with the originator antibody with respect to its structure, function, animal toxicity, clinical safety and effectiveness, human pharmacokinetics (PK), pharmacodynamics (PD) and immunogenicity 5,6. The approval rates of biosimilar antibodies have been slow due to the strict constraints on the final quality of the product. The exact manufacturing processes such as specific cell lines and culturing conditions through to the final processing steps can remain proprietary. What is more, the manufacturing of antibodies inherently involves a degree of variability which can add to the challenge of producing a highly similar product. A comprehensive physiochemical and biophysical characterization and comparison is quite difficult, yet a number of studies demonstrating the characteristics of biosimilar antibodies are emerging in the literature 7,8,9. Generating a therapeutic antibody begins with transfection of mammalian host cells with a vector carrying the genes for the respective antibody. Vector design, cell line and culture conditions are key considerations for setting up the expression system. The DNA sequences of antibodies can be sourced from Drug Bank (www.drugbank.ca), IMGT (www.igmt.org) or research publications including patents. For example, the sequence of trastuzumab is available through Drug Bank (DB ID: DB00072). The amino acid sequence of the variable regions can undergo gene design and optimization for synthesis in the desired host species. It is important for a biosimilar antibody that no modification is made to the amino acid sequence. Once synthesized, antibody genes can be subcloned into the appropriate vector of choice. Human IgG antibodies consist of two identical heavy chains and two identical light chains. Tightly regulated expression of both chains is essential for optimal production of heterologous IgG protein in mammalian cells 10. Intra- as well as inter-chain disulfide bonds have to be formed and a number of post-translational modifications have to be introduced during protein biosynthesis. A number of vectors are available that have been designed specifically to express antibody genes (refer to Table of Materials). These antibody-specific vectors usually express the constant regions for both heavy and light chains so only the variable regions of each chain require cloning. Transfection of cells with two independent constructs (co-transfection) is the most common approach for delivering heavy and light chain-encoding genes. That is, each gene is driven by its own promoter and transcribed as separate antibody chains before being assembled in the endoplasmic reticulum. On the other hand, multi-cistronic vectors have internal ribosome entry site (IRES) elements incorporated that allow expression of multiple genes as a single mRNA transcript with translation permitted from internal regions of the mRNA 11. In this instance, the heavy and light chain-encoding genes are coupled in an arrangement to achieve co-expression of both antibody chains 10,12. While transiently transfected cells yield sufficient protein to perform a limited number of experiments, stably transfected cell lines that have undergone selection for genome integration can deliver higher yields. Higher protein amounts allow for assay development relating to in vitro characterization and can provide an indication of antibody quality in consideration for downstream applications such as clonal cell line and lead candidate selection. The goal of this article is to describe the stable expression and purification of a therapeutic antibody produced in a mammalian expression system. Indeed, this method can be applied to the expression of a biosimilar antibody. The method can be used for the initial characterization of antibodies before proceeding on to the critical, albeit time-consuming steps of identifying a desirable clone for larger scale manufacturing. Moreover, this method can be used to express other proteins and not just antibodies. The following detailed protocol describes the expression of therapeutic antibody trastuzumab. This consists of preparation of vector DNA followed by stable transfection in HEK-293 cell line and purification of antibody protein by an automated chromatographic method. NOTE: A suitable mammalian expression vector must be used for this protocol. Here, a single construct containing two expression cassettes is used (i.e. heavy and light chain expression is driven by separate promoters). Trastuzumab heavy and light chains were previously cloned into the vector. This vector was a gift from Andrew Beavil, obtained through a not-for-profit plasmid repository 13. NOTE: Vector DNA was received as a soft agar stab culture in Escherichia coli XL-1 Blue strain; vector carries hygromycin resistance. Insert a sterile inoculation stab or loop into the soft agar of the stab culture then streak a Luria Bertani (LB) agar plate prepared with 75 µg/ml hygromycin for isolated colonies. Incubate the plate at 37 °C for 18-24 hr. Inoculate a single colony into 5 ml Terrific broth (TB) containing 75 µg/ml hygromycin. Incubate the culture at 37 °C for 18-24 hr with 225 rpm shaking. Use the overnight culture to prepare a glycerol stock of vector DNA by gently mixing 800 µl of culture with 200 µl 80% glycerol in a cryovial and freeze at -80 °C. Add 100 µl of the overnight culture to 100 ml TB containing 75 µg/ml hygromycin in a baffled shaker flask (i.e. 1/1,000 dilution). Incubate the culture at 37 °C for 18-24 hr with 225 rpm shaking. After overnight culture, extract and purify the DNA according to manufacturer's instructions of midi/maxi preparation kit with the following exception; during the final step, elute or resuspend DNA with water (pH 7.0-8.5). Check concentration and purity of DNA by absorbance readings at 260 and 280 nm then store DNA at -20 °C. NOTE: Optional (highly recommended): Sequence DNA using vector-specific primers to confirm identity. Grow and maintain HEK-293 cells (suspension cells) according to standard protocols in serum-free media supplemented with 0.1% non-ionic surfactant in Erlenmeyer flasks. Maintain at 2 x 105 cells/ml and subculture every fourth day. Culture cells at 37 °C with 5% CO2 and 120 rpm rotation. NOTE: Cells should have been in culture for no less than 4 days and no more than 4 weeks prior to transfection. HEK-293 cells grown as monolayers in serum-containing media can also be used for this procedure. Dilute DNA and polyethylenimine (PEI) separately in transfection media then mix together. Dilute 1.25 µg vector DNA per well (15 µg for 12 wells) in 300 µl transfection media. Incubate at room temperature for 5 min. Dilute 2.5 µl of 1 mg/ml PEI solution (30 µl for 12 wells; i.e. 1:2 ratio of DNA to PEI) in 300 µl transfection media. Incubate at room temperature for 5 min. Add diluted DNA to diluted PEI, gently mix and incubate at room temperature for 15 min. Add 50 µl of DNA/PEI mixture dropwise to each well of the plate. Rock the plate gently to distribute the transfection mixture then place the plate at 37 °C, 5% CO2 for 24 hr. Add 50 µg/ml hygromycin B per well and return plate to 37 °C, 5% CO2 for 10 days. NOTE: By Day 10, un-transfected cells will have died and detached from the surface of the plate, whereas stably-transfected cells will be viable and attached to the plate. Replace the media in wells with 1/4 volume serum-free media and 3/4 volume DMEM supplemented with 10% FBS (i.e. 0.5 ml serum-free media + 1.5 ml DMEM = 7.5% final serum concentration) and incubate for 4 days. Replace the media in wells with 1/2 volume serum-free media and 1/2 volume DMEM supplemented with 10% FBS (i.e. 1 ml serum-free media + 1 ml DMEM = 5% final serum concentration) and incubate for 4 days. Replace the media in wells with 3/4 volume serum-free media and 1/4 volume DMEM supplemented with 10% FBS (i.e. 1.5 ml serum-free media + 0.5 ml DMEM = 2.5% final serum concentration) and incubate for 4 days. Replace the media in wells with 2 ml of serum-free media supplemented with 0.1% non-ionic surfactant (i.e. 0% final serum concentration) and incubate for 4 days. NOTE: Maintain 50 µg/ml hygromycin B selective pressure on cells during serum-free adaptation. Cells adapted to serum-free media detach from the surface of wells and may cluster in suspension. Refer to step 2.1 for culture conditions with the additional supplement of 50 µg/ml hygromycin B. Using a pipette, gently mix the suspension cultures in the 12-well plate and pool cells into a separate tube. Using a hemocytometer, enumerate pooled cells and seed in 30 ml serum-free media in a Erlenmeyer flask at 2 x 105 cells/ml. Culture cells at 37 °C with 5% CO2 and 120 rpm rotation. Subculture and expand every fourth day. Continue to expand culture size to required cell density to obtain 10 vials at 1 x 107 cells/vial for cryopreservation in liquid nitrogen. Freeze the cells in serum-free media containing 10% dimethylsulfoxide (DMSO). NOTE: Conditioned media containing antibody can be harvested at each subculture to confirm protein production or used to optimize purification conditions. To harvest conditioned media and maintain cells for subculture, centrifuge the culture at 300 x g for 5 min then filter-sterilize supernatant through a 0.22 µm filter. Filtered supernatant may be kept at 4 °C for 1-2 weeks or -20 °C for longer term storage. NOTE: Antibody production can be followed on from step 2.11 where existing cells are expanded to the required cell density based on the batch overgrow culture volume to be setup. Otherwise, cells that have been thawed from cryopreservation begin at this stage once expanded to an appropriate cell density and volume. Various culture supplements may be used to optimize antibody production; the use of tryptone to increase antibody yield is demonstrated in this protocol. Seed cells at 2 x 105 cells/ml in 100 ml serum-free media in two Erlenmeyer flasks (to compare antibody yields from un-supplemented and nutrient-supplemented cultures). Culture at 37 °C, 5% CO2 and 120 rpm. After 24 hr, add tryptone to a final concentration of 0.5% to nutrient-supplemented culture. Equalize volume of un-supplemented culture with serum-free media. From day 8, perform cell counts of the cultures daily using a hemocytometer to monitor cell viability. Harvest the culture supernatants once cell viability is less than 80%. Harvest supernatant by centrifugation of the cultures at 3,000 x g for 15 min then filter-sterilize the supernatant (containing antibody) through a 0.22 µm filter. Store the supernatants at 4 °C (short-term) or freeze at -20 °C (long-term). NOTE: The following procedure can generally be applied to most automated systems. Purification can be performed at room temperature or at 4 °C (if FPLC system is kept in a cool room). A series of scouting tests can be performed to identify the optimal purification conditions including appropriate column matrix, binding buffer, elution buffer and pH to ensure maximum recovery of purified antibody from conditioned media (refer to Results section). The optimal conditions are dependent on the antibody or protein being purified. Purifications were performed on an automated FPLC system. Purifications were performed at room temperature using a 5 ml Protein A column. Prepare the following buffers using ultrapure water and adjust to the recommended pH then filter through a 0.22 µm filter. Prepare 1 L of phosphate buffered saline (PBS) pH 7.4 (binding buffer) by mixing the following: 0.14 M NaCl, 0.0027 M KCl, 0.01 M Na2HPO4 and 0.001 M KH2PO4. Adjust pH if necessary before filtering the buffer. Prepare 500 ml of 0.1 M glycine-HCl pH 2.7 (elution buffer). Adjust pH before filtering the buffer. Prepare 50 ml of 1 M Tris pH 9.0 (neutralization buffer). Ensure all system power and communication connections with computer are made. Devices should be visible in the software 'System Control' module. Ensure UV cell is set at 280 nm wavelength. Optional: Calibrate pH meter if connected and to be used. Immerse inlet tubes of A, B and sample pump in ultrapure water to wash the system. Purge the pumps with a syringe if there is air in the tubing or a suspicion of air in the system. Wash the system with water by manual operation via the system controller or via an automated method. Observe that pressure, conductivity, UV280 tracing and pH remain consistent and that the pressure limit for the column is not exceeded as per manufacturer's specification. NOTE: Abnormalities may indicate air or blockage in the system that should be addressed before proceeding. In the system controller module, start the flowrate at 1 ml/min manually via pump A in either load (bypassing sample loop) or inject (through the sample loop) position to begin connecting the column. Disconnect system tubing at the column position inlet and remove the stopper connected to the column inlet. Allow water to flow from the system tubing dropwise on top of the column then attach the system tubing to the column. Having the column inlet and inlet fitting overflowing with drops of water ensures a connection free of air bubbles. Attach the column outlet at the downstream outlet and verify all fittings are tightly fastened. With the column now attached to the system, do not exceed limits for maximum pressure limit and flowrate as outlined in column specifications. Wash column with 5 column volumes (CV) of water. If necessary, continue column wash until UV280 tracing has stabilized. Immerse inlet tubes of A in Binding buffer, B in Elution buffer and sample pump in Binding buffer to equilibrate the system in correct buffers. Fill the inlet tubes with buffer using PumpWash by manual operation. In the 'Method Editor' module of the software, use the method wizard to setup an affinity chromatography method for the column that is intended to be used. NOTE: Automated FPLC systems come with methods pre-filled with the recommended settings (i.e. flowrate and pressure limit) and run steps based on the column (manufacturer, matrix and size) selected for purification. Equilibrate system with 5 CV of Binding buffer and collect flowthrough into waste container. Load sample onto the column (volume to be loaded is specified manually in the method) and collect flowthrough into a separate container. Wash system with 5 CV of Binding buffer and collect flowthrough into a separate container. Elute column with 5 CV isocratic fractionation using Elution buffer and collect purified antibody sample as fractions by fraction collector. Once the method has been setup, specify the volume of conditioned media to be applied to the column and save the method. NOTE: The specified volume in the method should be 5-10 ml less than the actual volume to avoid introduction of air during the sample run. The specified volume used in this protocol is 90-120 ml. Submerge the sample pump tubing into the vessel containing the conditioned media. Prepare a separate container to collect sample flowthrough via the specified outlet tubing. NOTE: It is important to collect the flowthrough in the case an error occurs during the run or the binding capacity of the column is exceeded requiring the flowthrough to be reapplied to the column or the purification repeated. Prepare collection tubes in the fraction collector. Add 100 µl of neutralization buffer per 1 ml fraction volume. The FPLC system will automatically elute the fractions into the collection tubes. In the 'System Control' module of the software, open the method to be run. NOTE: The method run is initiated in a series of pages that include checking the variables of the method, fraction collector setup and defining result file name and storage location. Click START to initiate the run. The run can be monitored in the 'System Control' module. At the completion of the purification run, check the resulting chromatogram in the 'Evaluation' module in the system software. Combine all protein-containing fractions into a separate tube, buffer exchange and concentrate in PBS using a centrifugal filter device with 30 kDa molecular weight cut off. Perform centrifugation steps according to manufacturer's instructions. Measure antibody concentration using bicinchoninic acid assay (BCA) according to manufacturer's instructions. If another purification run is to be performed, prime the sample pump tubing in Binding buffer and repeat steps 4.9-4.14. At the completion of purification runs, immerse inlet tubes of A, B and sample pump in ultrapure water and wash the system and column as performed in step 3. Submerge A, B and sample pump tubing in 20% ethanol and repeat wash procedure for storage of the system and column. Disconnect the column from the downstream outlet and replace column stopper, then disconnect column at the inlet and replace stopper, reconnect tubing to the system. Store the column at 4 °C. Stable production of trastuzumab by transfected HEK-293 cells was confirmed using bio-layer interferometry (BLI) as presented in Figure 1. An IgG standard curve was generated by measuring the binding rate between an IgG antibody standard and Protein A biosensor (Figure 1A). The crude supernatant sample was similarly measured, then its concentration interpolated from the standard curve (Figure 1B). The supernatant concentration was measured to be approximately 25 µg/ml (sampled from 50 ml collected at subculture) two weeks after serum-free adaptation and prior to setting up cells for overgrow batch cultures. Supernatant collected at each subculture after serum-free adaptation was pooled and used to optimize purification conditions; scouting of binding and elution buffers was performed as shown in Figure 2. The steps of purification are depicted in Figure 2A based on UV280 signal. Once the Protein A column equilibrates, an increase in UV280 signal represents sample loading; this increase is due to supernatant flowthrough passing through the column (containing unbound proteins which absorb UV light at this wavelength), while antibodies have been captured by the column. Once the sample has finished loading, the UV280 signal returns to baseline as any remaining unbound proteins are washed away. Elution occurs as pH decreases to the optimal pH to release the antibodies captured by the column, depicted by an increase in UV280 signal with eluted antibodies fractionated and collected by the fraction collector. Throughout the sample run, conductivity changes based on the salt concentration in the buffers whereas system pressure should remain relatively constant. 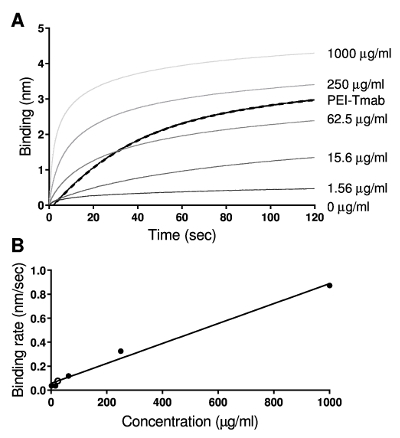 Optimal elution, pH and buffer was scouted first (Figure 2B); it was observed that antibody eluted more efficiently off the column at lower pH using either 0.1 M glycine HCl or citric acid. However, below pH 2.7 there was no further improvement in the elution profile. In addition, elution peaks with 0.1 M glycine HCl appeared less broadened when compared with 0.1 M citric acid at similar pH (Figure 2B). Subsequently, 0.1 M glycine-HCl pH 2.7 buffer was used to optimize binding buffer conditions (Figure 2A). The effect of different binding buffers on elution was also compared (Figure 2A). It was observed that PBS pH 7.4 and 20 mM sodium phosphate pH 7 had comparable elution profiles, while the addition of 3 M NaCl to sodium phosphate buffer (to enhance antibody binding to the column) was not favorable. Due to the ease of PBS buffer preparation, PBS pH 7.4 was selected as the binding buffer for future purifications. The purification chromatograms of batch overgrow cultures are shown in Figure 3; tryptone-supplemented culture is compared to un-supplemented culture. It was noted that the addition of tryptone to the supplemented culture resulted in an increased UV280 signal during the sample loading step, compared to the un-supplemented culture. The tryptone-supplemented culture yielded 3.8 mg and the un-supplemented culture 1.7 mg of trastuzumab, based on protein recovered after buffer exchange and concentration. 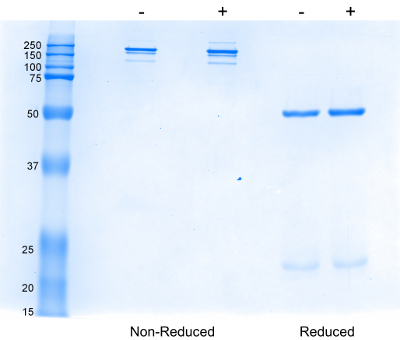 Quality control of the purified antibody was confirmed by sodium dodecyl sulfate polyacrylamide gel electrophoresis (SDS-PAGE) as shown in Figure 4. Trastuzumab grown in un-supplemented and tryptone-supplemented conditions results in similar antibody profiles under non-reducing and reducing conditions. As expected, a prominent band at approximately 150 kDa confirms correctly folded antibody; other bands represent fragmented forms of the antibody, a result of disulfide bond breakage and a method-induced artefact. Likewise, two bands at 50 and approximately 25 kDa confirm the presence of antibody heavy and light chains, respectively. Figure 1: Confirmation of protein production by stably transfected HEK-293 cells using bio-layer interferometry (BLI). 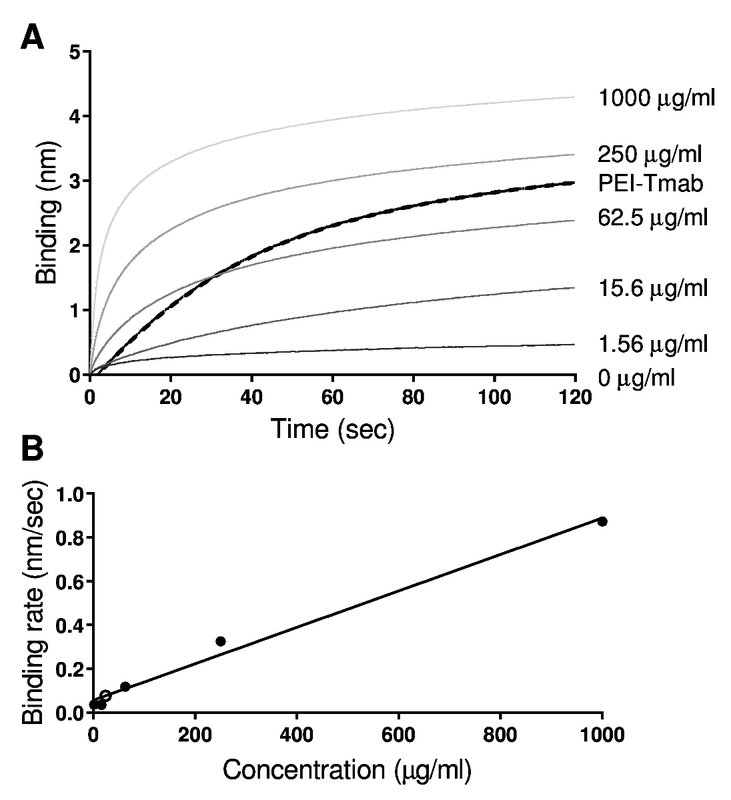 (A) Standard curve was generated by measuring binding rate of IgG antibody standard to protein A biosensor over 120 seconds (grey) followed by crude supernatant sample of PEI-transfected trastuzumab (PEI-Tmab; black). (B) Concentration of antibody protein in crude supernatant (open black circle) was interpolated from standard curve (closed black circles) by plotting IgG antibody standard concentration versus binding rate. Please click here to view a larger version of this figure. Figure 2: Purification chromatograms of elution and binding buffer scouting experiments. (A) The steps of purification are depicted according to UV280 signal (blue, green or black lines); sample loading onto the column followed by column wash to wash away unbound proteins then elution of bound protein from the column. Measurement of pH (red line), conductivity (brown line) and system pressure (grey line) is monitored throughout the run. Three buffers were tested for optimal binding of trastuzumab to the column and washing away of unbound protein to maximize elution yield. 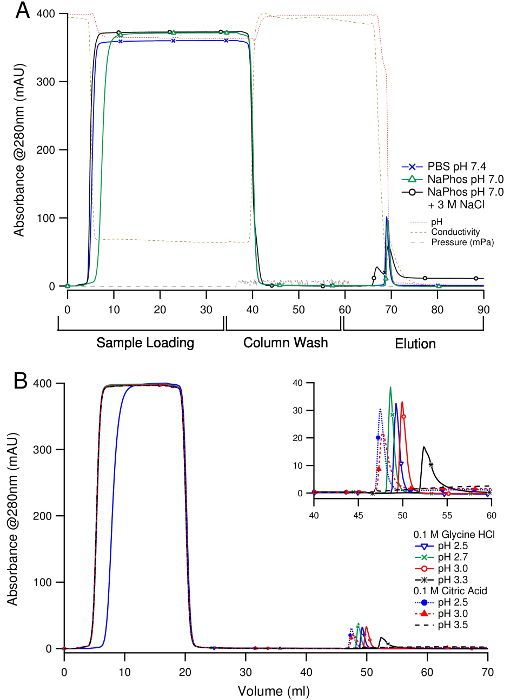 (B) 0.1 M glycine-HCl (pH 2.5-3.3) and 0.1 M citric acid (pH 2.5-3.5) buffers were tested for optimal elution of trastuzumab from protein A column. Please click here to view a larger version of this figure. 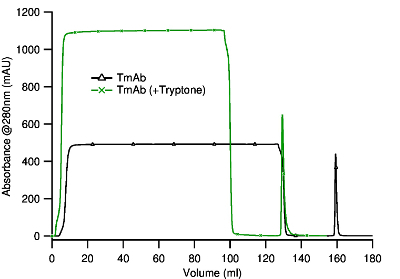 Figure 3: Purification chromatograms of trastuzumab (TmAb) batch overgrow cultures grown with no supplement or supplemented with tryptone. Stably transfected HEK-293 cells were setup at 2 x 105 cells/ml and cultured for 8 days either un-supplemented (120 ml; black line) or supplemented with 0.5% tryptone (90 ml; green line). After harvesting, supernatants were purified using PBS pH 7.4 (binding buffer) and 0.1 M glycine-HCl pH 2.7 (elution buffer). Please click here to view a larger version of this figure. Figure 4: Analysis of purified trastuzumab by SDS-PAGE. Approximately 2 µg of trastuzumab purified from un-supplemented (-) or tryptone-supplemented (+) cultures was sampled by 10% SDS-PAGE under non-reduced or reduced conditions. The gel is stained with coomassie R-250. Please click here to view a larger version of this figure. This protocol details the transfection, stable expression and purification of a therapeutic antibody in HEK-293 cells. Stable expression of antibody genes is the first step in generating an antibody-producing cell line for the development and manufacture of a therapeutic antibody. While Chinese hamster ovary (CHO) cells remain the expression platform of choice for therapeutic proteins, the HEK-293 cell line is gaining prominence with the realization that proteins produced in these cells are a closer match to naturally occurring human proteins, in terms of post-translational modifications and function 14,15. Mammalian cell lines including CHO (e.g., CHO-DG44 and CHO-K1) as well as non-immunoglobulin secreting murine B cell lines NS0 and SP2/0 are predominantly used in biopharmaceutical production. Expression systems based on these cell lines are based on selection processes whereby high producing clones are induced and selected through incremental addition of a specific selective drug 16,17. The selection process for a stable clone can therefore be arduous and time-consuming. In comparison to these existing methods, the HEK-293 cell line robustly transfects with high efficiency. The selection process is simplified and very easily adapts to serum-free suspension culture, making it an ideal expression system for laboratory scale production of proteins 18. A limitation of stable transfection is time in which a practical amount of protein can be produced and utilized in experiments. To try and overcome this, the current protocol describes a culturing step that can achieve substantial amounts of protein within 3-6 weeks of transfection. The batch overgrow cultures (large scale production) provide the opportunity to produce substantial amounts of antibody for the setup of in vitro characterization experiments in the lead up to selection of a clonal cell line and lead candidates. This has clear advantages over transient transfection, which can require higher amounts of DNA and reagents. In addition, the protein yield is not reproducible from batch to batch since expression is only temporary and determined by transfection efficiency. The addition of tryptone in this protocol provided an increased yield in protein expression. Addition of tryptone to transfection cultures has previously been shown to improve protein synthesis 19,20. The tryptone supplemented culture resulted in improved trastuzumab antibody yields of 40 mg/L versus the un-supplemented culture of 14 mg/L (Figure 3). SDS-PAGE verified that: (1) the antibody was being produced correctly; and (2) the addition of tryptone did not alter structure based on comparison of the antibody bands under non-reducing and reducing conditions (Figure 4). The addition of tryptone to the cultures is optional and is particularly used to achieve higher protein yields. Other supplements have been considered to enhance protein expression such as sodium butyrate and valproic acid 21,22,23. The first checkpoint of the protocol is the confirmation that protein is being produced by the transfected cell line. This step may be performed any time after the two-week period of selective pressure used to select stable transformants. A number of methods may be used to confirm protein production including bio-layer interferometry (Figure 1) or the similar approach of an IgG ELISA. Alternatively, a western blot may be performed using an anti-IgG detection antibody to identify antibody protein in the crude supernatant or purified sample. Other researchers have shown that higher transfection efficiency is achieved using adherent cells in serum-containing media 24. The presence of supplements from animal origin is undesirable for biopharmaceutical production. Therefore, the sequential adaptation to serum-free media is a critical step in the protocol requiring patience and careful monitoring of cell viability. The 4-day turnover period suggested in this protocol is a guide and so if problems are encountered at a certain serum concentration, it is recommended that the cells be subcultured 2-3 times in the previous ratio of serum-containing to serum-free media before continuing with the next ratio. Prior to setting up batch cultures and cryopreservation of cells, consider that most cell lines are deemed fully adapted after three subcultures in 100% serum-free media. One of the most crucial steps at the purification stage is the scouting for optimal conditions and buffers to ensure efficient binding of the antibody to the column and then complete elution off the column (Figure 2). The conditioned media collected at each subculture is useful for this purpose. In this case, the elution buffer of citric acid pH 3.5 generally recommended for protein A affinity chromatography was unsuitable for elution of trastuzumab from the column. The scouting experiment using two different elution buffers at various pH clearly showed that even within the narrow range of pH tested, the degree of elution was affected (Figure 2B). In terms of downstream processing of the antibody fractions after purification, the antibody can be buffer-exchanged using a desalting column either by manual or automated operation. Alternatively, dialysis membrane can also be used. Final protein concentration can be determined by other protein quantification methods including measurement of the absorbance signal at 280 nm with concentration deduced from Beer Lambert's Law based on the extinction coefficient of the antibody. This protocol has successfully produced the antibody protein of trastuzumab by stable transfection of HEK-293 cells. The antibody was purified and characterized to confirm integrity. The steps in this protocol detailing DNA preparation, stable transfection followed by serum-free adaptation, large scale production and automated purification can be transferred to producing other proteins. The research was supported by the University of Sydney. pVITRO1-Trastuzumab-IgG1/κ was a gift from Andrew Beavil (Addgene plasmid # 61883). We thank Tihomir S. Dodev for useful discussions regarding pVITRO1-Trastuzumab-IgG1/κ. pFUSE vector series InvivoGen N/A Heavy and light antibody genes expressed in separate vectors that require co-transfection. mAbXpress vector series ACYTE Biotech Pty Ltd. Heavy and light antibody genes expressed in separate vectors that require co-transfection. Refer to: Jones, M. L. et al. A method for rapid, ligation-independent reformatting of recombinant monoclonal antibodies. J Immunol Methods. 354 (1-2), 85-90, doi:10.1016/j.jim.2010.02.001, (2010). pVITRO1 vector N/A N/A Heavy and light antibody genes are each driven by a separate promoter in a single vector. Refer to: Dodev, T. S. et al. A tool kit for rapid cloning and expression of recombinant antibodies. Sci Rep. 4 5885, doi:10.1038/srep05885, (2014). GS vector series Lonza Multi-cistronic vector with heavy and light antibody genes co-expressed and translated as single transcript. Multi-cistronic vector series 1 N/A N/A Multi-cistronic vector with heavy and light antibody genes co-expressed and translated as single transcript. Refer to: Li, J. et al. A comparative study of different vector designs for the mammalian expression of recombinant IgG antibodies. J Immunol Methods. 318 (1-2), 113-124, doi:10.1016/j.jim.2006.10.010, (2007). Multi-cistronic vector series 2 N/A N/A Multi-cistronic vector with heavy and light antibody genes co-expressed and translated as single transcript. Refer to: Ho, S. C. et al. IRES-mediated Tricistronic vectors for enhancing generation of high monoclonal antibody expressing CHO cell lines. J Biotechnol. 157 (1), 130-139, doi:10.1016/j.jbiotec.2011.09.023, (2012). pVITRO1-Trastuzumab-IgG1/κ Addgene 61883 Mammalian expression vector containing trastuzumab antibody genes with hygromycin resistance gene; pVITRO1-Trastuzumab-IgG1/κ was a gift from Andrew Beavil. Fast-Media Hygro Agar Jomar Life Research fas-hg-s Used to prepare low salt LB agar containing 75 µg/ml hygromycin. Fast-Media Hygro TB Jomar Life Research fas-hg-l Used to prepare low salt TB broth containing 75 µg/ml hygromycin. Glycerol, BioXtra, ≥99% Sigma-Aldrich G6279 Prepare to 80% with water and autoclave. Store at room temperature. Jestar 2.0/LFU Plasmid Maxi Kit Astral Scientific G221020 Plasmid Maxi Prep Kit; elute or resuspend DNA in water (pH 7.0-8.5). FreeStyle 293-F Cells Life Technologies R790-07 HEK-293 cell line adapted to suspension culture in serum-free media. FreeStyle 293 Expression Medium Life Technologies 12338-018 Serum-free media specially formulated for maintaing 293-F cell line and high protein expression. Kolliphor P188 Sigma-Aldrich K4894 Non-ionic surfactant; pluronic F-68; prepare to 10% in water and filter-sterilize using 0.22 μm filter. Store at 4 °C. Polyethylenimine, Linear, MW 25,000 Polysciences, Inc. 23966 Prepare to 1 mg/ml in water. Adjust to pH 7.0 with 1 M HCl (solution becomes clear) and filter-sterilize using 0.22 μm filter. Store at -80 °C until use. Tryptone (casein peptone) Thermo Fisher Scientific LP0042B Prepare to 20% in PBS and filter-sterilize using 0.22 μm filter. Store at 4 °C. AKTApurifier 100 GE Healthcare 28406266 Automated FPLC system, which can include a P-960 sample pump and Frac-920 fraction collector. Amicon Ultra Centrifugal Filters (30 MWCO) Merck Millipore UFC803008/UFC903008 Used to buffer exchange and concentrate purified protein. BLItz System fortéBIO 45-5000 Instrument used for bio-layer interferometry (BLI) measurements. Nelson, A. L., Reichert, J. M. Development trends for therapeutic antibody fragments. Nat Biotechnol. 27, (4), 331-337 (2009). Drake, P. M., Rabuka, D. An emerging playbook for antibody-drug conjugates: lessons from the laboratory and clinic suggest a strategy for improving efficacy and safety. Curr Opin Chem Biol. 28, 174-180 (2015). Kontermann, R. E., Brinkmann, U. Bispecific antibodies. Drug Discov Today. 20, (7), 838-847 (2015). Beck, A., Wurch, T., Bailly, C., Corvaia, N. Strategies and challenges for the next generation of therapeutic antibodies. Nat Rev Immunol. 10, (5), 345-352 (2010). Food and Drug Administration. 22, Food and Drug Administration. eds U.S. Department of Health and Human Services, Food and Drug Administration, Center for Drug Evaluation and Research (CDER), & Center for Biologics Evaluation and Research (CBER) (2015). European Medicines Agency. 13, European Medicines Agency. eds European Medicines Agency (EMA) & Committee for Medicinal Products for Human Use (CHMP) (2014). Lopez-Morales, C. A., et al. Physicochemical and biological characterization of a biosimilar trastuzumab. Biomed Res Int. 2015, 427235 (2015). Jung, S. K., et al. Physicochemical characterization of Remsima. MAbs. 6, (5), 1163-1177 (2014). Visser, J., et al. Physicochemical and functional comparability between the proposed biosimilar rituximab GP2013 and originator rituximab. BioDrugs. 27, (5), 495-507 (2013). Li, J., et al. A comparative study of different vector designs for the mammalian expression of recombinant IgG antibodies. J Immunol Methods. 318, (1-2), 113-124 (2007). Fitzgerald, K. D., Semler, B. L. Bridging IRES elements in mRNAs to the eukaryotic translation apparatus. Biochim Biophys Acta. 1789, (9-10), 518-528 (2009). Ho, S. C., et al. IRES-mediated Tricistronic vectors for enhancing generation of high monoclonal antibody expressing CHO cell lines. J Biotechnol. 157, (1), 130-139 (2012). Dodev, T. S., et al. A tool kit for rapid cloning and expression of recombinant antibodies. Sci Rep. 4, 5885 (2014). Walsh, G. Post-translational modifications of protein biopharmaceuticals. Drug Discov Today. 15, (17-18), 773-780 (2010). Backliwal, G., et al. Rational vector design and multi-pathway modulation of HEK 293E cells yield recombinant antibody titers exceeding 1 g/l by transient transfection under serum-free conditions. Nucleic Acids Res. 36, (15), 96 (2008). Bebbington, C. R., et al. High-level expression of a recombinant antibody from myeloma cells using a glutamine synthetase gene as an amplifiable selectable marker. Biotechnology (N Y). 10, (2), 169-175 (1992). Kaufman, R. J., et al. Coamplification and coexpression of human tissue-type plasminogen activator and murine dihydrofolate reductase sequences in Chinese hamster ovary cells. Mol Cell Biol. 5, (7), 1750-1759 (1985). Dalton, A. C., Barton, W. A. Over-expression of secreted proteins from mammalian cell lines. Protein Sci. 23, (5), 517-525 (2014). Pham, P. L., et al. Transient gene expression in HEK293 cells: peptone addition posttransfection improves recombinant protein synthesis. Biotechnol Bioeng. 90, (3), 332-344 (2005). Pham, P. L., et al. Large-scale transient transfection of serum-free suspension-growing HEK293 EBNA1 cells: peptone additives improve cell growth and transfection efficiency. Biotechnol Bioeng. 84, (3), 332-342 (2003). Yang, W. C., et al. 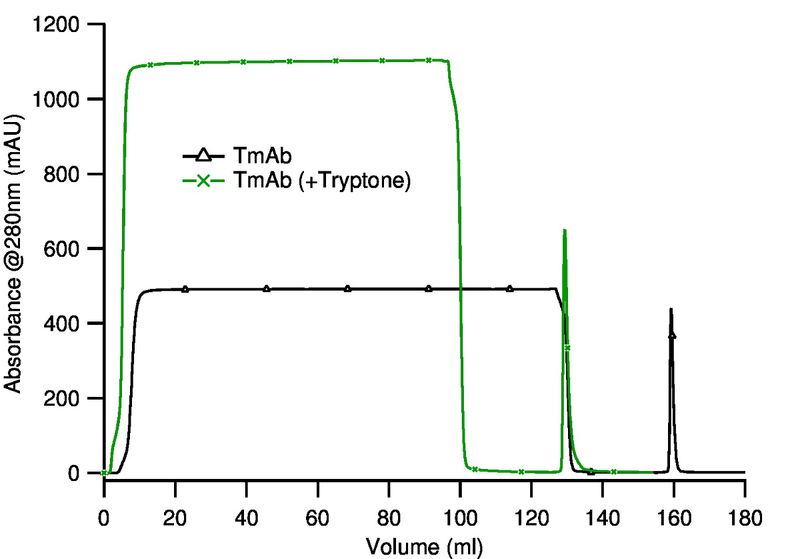 Addition of valproic acid to CHO cell fed-batch cultures improves monoclonal antibody titers. Molecular Biotechnology. 56, (5), 421-428 (2014). Backliwal, G., et al. Valproic acid: a viable alternative to sodium butyrate for enhancing protein expression in mammalian cell cultures. Biotechnol Bioeng. 101, (1), 182-189 (2008). Jiang, Z., Sharfstein, S. T. Sodium butyrate stimulates monoclonal antibody over-expression in CHO cells by improving gene accessibility. Biotechnol Bioeng. 100, (1), 189-194 (2008). Jordan, M., Wurm, F. Transfection of adherent and suspended cells by calcium phosphate. Methods. 33, (2), 136-143 (2004).